Annecy ([ansi]; Arpitan: Èneci or Ènneci) is the largest city of Haute-Savoie department in the Auvergne-Rhône-Alpes region in southeastern France. It lies on the northern tip of Lake Annecy, 35 kilometers (22 mi) south of Geneva. Nicknamed the "Pearl of French Alps" in Raoul Blanchard's monograph describing its location between lake and mountains, the city controls the northern entrance to the lake gorge. Due to the lack of available land, its resident population has remained stagnant, with 52,029 inhabitants living within the city limits in 2013. However, its urban area, with 221,000 inhabitants, is on the 5th regional position, just behind the Geneva-Annemasse urban area, which counts 292,000 inhabitants in the northern department. Switching from counts of Geneva’s dwelling in the 13th century, to counts of Savoy’s in the 14th century, the city became the capital of the Savoy province in 1434 during the prerogative of Genevois-Nemours until 1659. Its role increased in 1536, during the Calvinist Reformation of Geneva, while the bishop took refuge in Annecy. St Francis de Sales gave Annecy its role of advanced citadel of the Catholic Counter-Reformation. The annexation of Savoy will link the city to France in 1860. Sometimes called "Venice of the Alps", this idyllic and touristic representation comes from its two canals and the Thiou river lying through the old city and whose initial role was to protect the city and to empower its handicrafts. The city experienced an industrial development in the 19th century with silk manufacturing. Some of its industrial legacy remains today within the head offices of NTN-SNR bearings, Salomon, Entremont and Dassault Aviation. 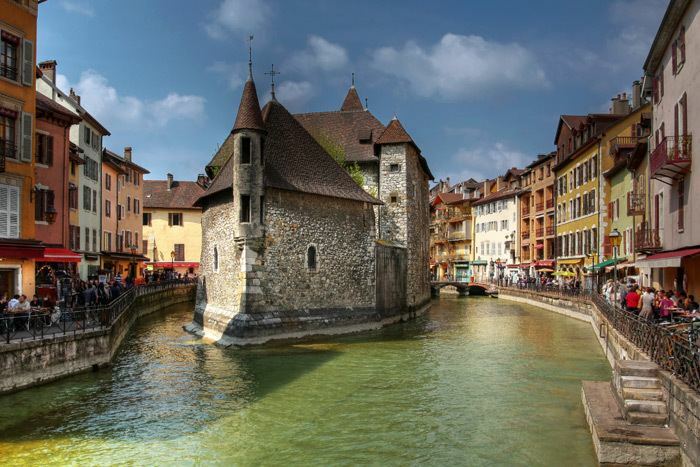 Since the end of the 19th century, Annecy has developed as a tourist center with the proximity of the lake, winter resorts and the renovation of its castle, inaugurated with the opening of its fine art museum in 1956. The municipal environmental policy managed to keep 40.3% of green spaces and the city and was awarded the "Golden Flower" in 2015, given to the nine most-flowered French cities. Since 1960 Annecy has been the organiser of the Annecy International Animated Film Festival, hosted at the Bonlieu Cultural Centre. It has also been a growing educational center since the establishment of the University of Savoy in 1973. The Fier forms part of the commune's northwestern border. 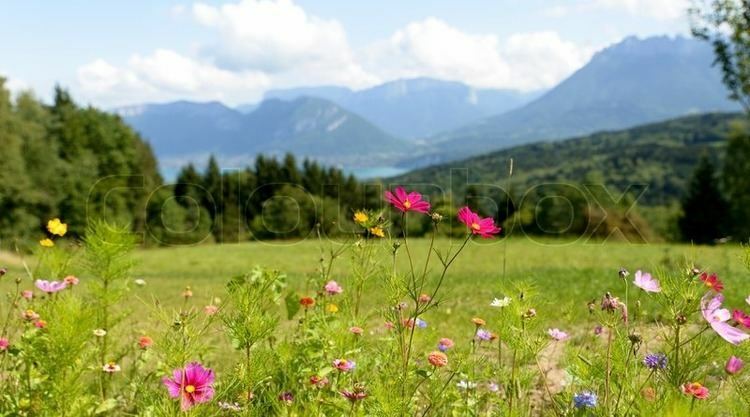 The mountains around the town of Annecy are Mont Veyrier, Le Semnoz, La Tournette, and the Parmelan. Nearby Annecy-le-Vieux ("Old Annecy") was a settlement from the time of the Romans. 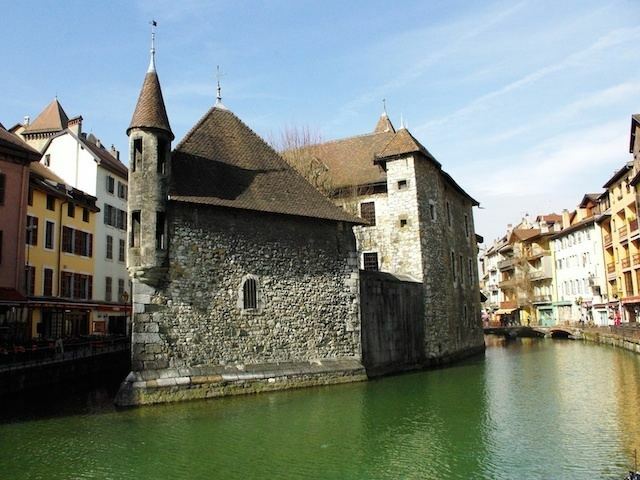 Annecy was the court of the counts of Geneva or Genevois from the 10th century. It passed to the counts of Savoy in 1401. In 1444, it became the regional capital of the provinces of Genevois, Faucigny, and Beaufortain. With the advance of Calvinism, Annecy became a center for the Counter-Reformation, the old Bishopric of Geneva being transferred to it in 1535. Francis of Sales was born in Sales, France in 1567 and served as bishop of Annecy from 1602 to 1622; his relics are preserved in the cathedral. During the French Revolution, the Savoy region was conquered by France. Annecy became attached to the department of Mont Blanc, whose capital was Chambéry. The Catholic diocese was suppressed in 1801. After the Bourbon Restoration in 1815, Annecy was returned to the King of Sardinia and the Catholic diocese restored in 1822. When Savoy was sold to France in 1860, it became the capital of the new department of Haute-Savoie. Annecy was the site of the second round of General Agreement on Tariffs and Trade (GATT) talks in 1949. In 2012, a multiple murder occurred in the Annecy area. The new municipality was established on 1 January 2017 by merger with the former communes of Annecy-le-Vieux, Cran-Gevrier, Meythet, Pringy and Seynod. Annecy is part of 4 cantons (Annecy-1, Annecy-2, Annecy-le-Vieux and Seynod) and it is the Prefecture of Haute-Savoie. Since 2017, Annecy is formed of six "communes déléguées" (commune delegate): Annecy, Annecy-le-Vieux, Cran-Gevrier, Meythet, Pringy and Seynod. The local government is formed of the City council, composed of 202 members. Each commune delegate has a number of members depending upon its population. The Mayor is Jean-Luc Rigaut (UDI) since 2007. The intercommunality of Annecy, Grand Annecy Agglomération, includes 34 municipalities. Annecy has hosted the Annecy International Animated Film Festival since 1960 and the Rencontres Internationales d'Annecy Cinéma & Architecture since 1999. On 23 July 2009, Annecy played host to Stage 18 of the Tour de France, as the start/finish point for an individual time trial around Lake Annecy. Annecy launched a bid to host the 2018 Winter Olympic Games but lost to Pyeongchang. If they had been chosen, Annecy would have been the fourth French city to host the Winter Olympic Games, after Chamonix (1924), Grenoble (1968), and Albertville (1992). Ligue 1 former team Évian Thonon Gaillard F.C. played their home matches in Annecy. The club was founded in 2007, they grew up to reach Ligue 1, and stayed for three years in the division, thanks to their emblematic trainer Pascal Dupraz. The Annecy basin is one of the world's leading locations for the sport of paragliding, an activity of some economic importance to the region. The area regularly hosts major competitions, most recently a leg of the Paragliding World Cup in 2012. Due to its proximity with the lake and the mountains, Annecy is also popular for watersports (sailing, rowing, wakeboarding, water skiing) and wintersports (alpine skiing, snowboarding, Nordic skiing). Le Semnoz, a relatively small ski resort is 35 minutes away from Annecy. Other bigger ski resorts, La Clusaz and Le Grand Bornand, are only 40 minutes away. Annecy is also very popular among trail runners and many races are organized year round, such as the World Trail Running Championships in 2015. Palais de l'Isle is a castle in Geneva's administrative headquarters, then alternately a courthouse, a mint, and the Middle Ages until 1865 and then again during World War II. The Palais de l'Ile was classified as a Historical Monument in 1900, and today houses a local history museum. Different R&D activities in the Université de Savoie and its École Polytechnique d'Ingenieurs: Polytech'Savoie. In the 19th century, the primary manufactures were linen and cotton goods, glass, cutlery, earthenware, and leather. The area also carried on linen bleaching and iron mining. 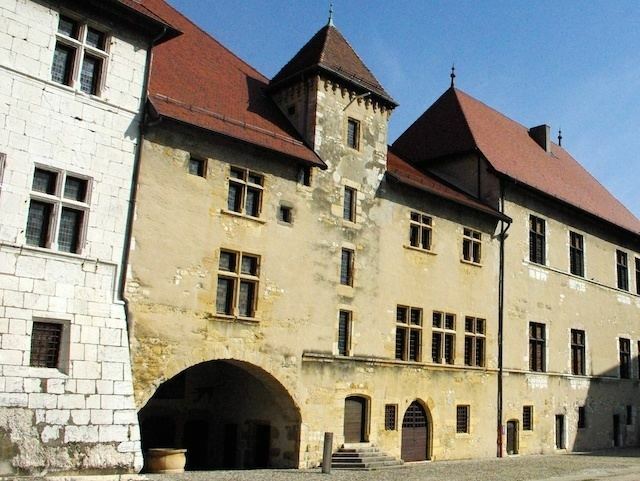 By the First World War, it was connected by rail to Aix-les-Bains and there were factories for linen and cotton goods, felt hats, and paper, as well as a "celebrated" bell foundry at Annecy-le-Vieux. The Gare d'Annecy railway station offers connections with Lyon, Geneva, Paris, Grenoble and several regional destinations. Together with other Alpine towns Annecy engages in the Alpine Town of the Year Association for the implementation of the Alpine Convention to achieve sustainable development in the Alpine Arc. 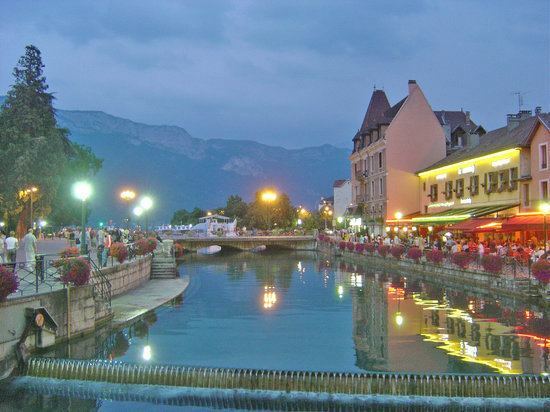 Annecy is also Alpine Town of the Year 2012.